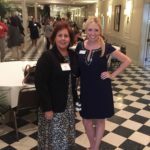 The Monson Law Firm attended the New Orleans Claims Association’s October lunch meeting at Ye Old College in New Orleans. 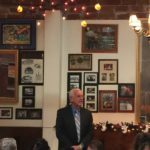 Pictured is our guest speaker, Louisiana Insurance Commissioner Jim Donelon! Click here to view pictures! 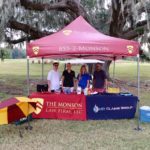 The Monson Law Firm sponsored a hole at the Risk Insurance Management Society’s 2017 Golf Tournament in New Orleans at Audubon Golf Course. Pictured are Matthew Monson, Esq., Ann’Lee Earles, Lindsay Lambert and Darryn Melerine with MD Claims Group. Click here to view pictures! The Monson Law Firm attended the Louisiana Surplus Lines Association’s Mid- Year Conference at Metairie Country Club. Pictured are Matthew Monson, Esq. 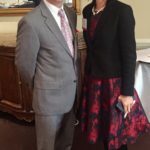 and Enya He, Ph.D., FCII with Lloyd’s America, Inc. Click here to view pictures! Happy Columbus Day from The Monson Law Firm! Happy Columbus Day from The Monson Law Firm! 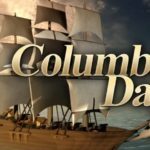 Columbus Day is a U.S. holiday that commemorates the landing of Christopher Columbus in the Americas on October 12, 1492. It was unofficially celebrated in a number of cities and states as early as the 18th century, but did not become a federal holiday until 1937. For many, the holiday is a way of both honoring Columbus’ achievements and celebrating Italian-American heritage. Click here to view pictures! The Monson Law Firm attended the Baton Rouge Chapter of Independent Insurance Agent’s Fall Social at Drusilla Catering. 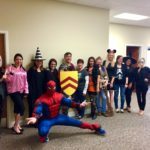 Pictured are Trish Bump with Foremost Insurance Group and Ann’Lee Earles, CISR, CPIA with The Monson Law Firm. Click here to view pictures! The Monson Law Firm attended the North Shore Chapter of Professional Insurance Agents of Louisiana’s lunch meeting at Keith Young’s in Madisonville. 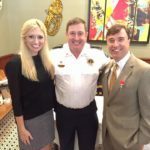 A special thank you to the St. Tammany Parish Sheriff, Randy Smith, for coming to speak today! Pictured are Ann’Lee Earles, CISR, CPIA, Sheriff Randy Smith and Matthew Monson, Esq. Click here to view pictures! For the third time, The Monson Law Firm was successful in limiting the fees sought by Nader “Anthony” Odeh for his deposition testimony. During Odeh’s deposition in the case of Doris Kelly vs. Lighthouse Property Insurance Corporation, Mr. Odeh walked out of his deposition due to a dispute over his fees. Prior to the deposition, Odeh sought $450.00 per hour with a $1,500.00 minimum. However, in open Court on April 20, 2017, the Honorable Kern A. Reese limited Mr. Odeh’s fees to $150.00 per hour. Considering the paucity of educational background and the shallowness of relevant experience reflected in Odeh’s curriculum vitae, including no evidence that he has ever been recognized as an expert in any federal court….I find that Odeh is appropriately compensated for Rule 26(b)(4) purposes at the low end of the approval range; specifically, $150.00 per hour for time actively spent in providing his deposition testimony. Likewise, in the case of Christopher Dickerson v. Lighthouse Property Insurance Corporation, the Honorable Wilson Fields limited Odeh’s fees to $150.00 per hour in an April 26, 2016 hearing. Copies of the Court’s Judgments can be found here: Doris Kelly Judgment , Marquette v SFIC, and Dickerson v Lighthouse.